Welcome to Forensicare’s Professional Development and Training Program. Forensicare’s Training Unit, in collaboration with the Centre for Forensic Behavioural Science, provides a professional development program for services, teams, individuals and organisations looking to expand their knowledge and understanding of forensic behaviour and mental health issues. Workshops are provided throughout the year and are also available on request. 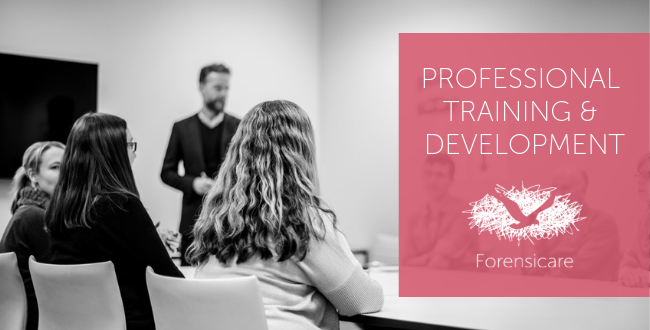 Our training program aims to promote knowledge and skills utilising evidence based expertise developed on a foundation of advancing consumer-informed best practice. As a specialist service, Forensicare trainers include some of the most highly regarded and experienced clinicians and researchers in the field of forensic mental health. Our current program will be of interest to a wide cross section of individuals and organisations including Area Mental Health Services, Non-government organisations, the legal, medical and allied health professions, and universities. Take a look at our upcoming courses below or download our 2019 Autumn-Winter Professional Training & Development Program flyer. Fear, hatred, disgust and banishment dominate societal discourse about those who commit sexual offences. Legal measures to control the risk posed by sexual offenders are expanding. In this context, it is important that practitioners and services understand the research evidence base and best practice in the assessment, treatment and management of those who sexually offend. This full day workshop will give attendees an up-to-date detailed and evidence based overview of: the nature and prevalence of sexual offending; theoretical models of sexual offending; the relationship between sexual offending and mental disorders; risk factors, protective factors and risk assessment; managing sexual offenders; pharmacological treatment; psychological treatment; and, online sexual offending. It is suitable for practitioners from mental health, correctional, police or legal backgrounds who want to develop their knowledge of sexual offenders. Dr Raj Darjee is a Consultant Forensic Psychiatrist with the Forensicare Problem Behaviour Program and Senior Research Fellow (Adjunct) at the Centre for Forensic Behavioural Science, Swinburne University of Technology. Raj has worked with perpetrators of sexual abuse in community, prison, court and forensic hospital contexts in the UK and in Australia for over 15 years. He took a lead clinical role in Scotland, working with government, forensic mental health services, corrections and the police in developing and implementing policies for the management of sexual offenders. He has also researched and published on many forensic topics, including sexual violence. This full day workshop offers the opportunity for case managers and therapists to enhance their knowledge and skills in the engagement and management of clients who present with complex needs, who are often mandated to engage with services. The clients that will be discussed are those who: have co-morbid health and mental health disorders, are reluctant to engage, pose risks to either themselves or others, have multi service involvement, and have been mandated for treatment by either civil or criminal justice orders. We will discuss the best models of care in working with this client population, ways of engaging the clients, and strategies for convening case conferences with multiple services that generate better outcomes for clients. The ethical dilemmas and challenges of client confidentiality will be covered, particularly when communicating identified risks with other services. This will be an interactive session using case studies and there will be opportunities to reflect upon practice. This session is suitable for experienced workers in both the government and non-government sectors and in the fields of mental health, disability, drug and alcohol, child protection and corrections. Danielle Ashley is a senior Occupational Therapist at Forensicare. Kerstin Hinrichsen is a senior Social Worker at Forensicare and is Tambo Unit Program Manager at Ravenhall Correctional Centre. David Willshire is a Clinical and Forensic Psychologist and a Principal Psychologist at Forensicare. Anthea Lemphers is Director of Psychological Services at Forensicare. We also provide customised training and related services based on your needs and specific requests. This includes a range of organisational related services including individual and team supervision, facilitation of team processes, and organisational advisory services drawing on specialist clinical, management and service delivery experience. If you would like more information, please contact the Forensicare’s Professional Development and Training team training@forensicare.vic.gov.au.